The Sola by BodyBilt offers the breathability of a mesh back, and a variety of BodyBilt seat styles. 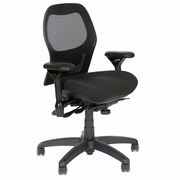 The Sola features a unique, contoured mesh back design with an adjustable, integrated lumbar support which may be set at any of eight positions. The back tilt is adjustable to preference. The R-style synchro-tilt mechanism features easily accessible controls with anti-kickback lockout. The seat slider allows for the perfectly positioning of the distance between the seat and back. This chair is ideally suited for the user who prefers a firm feel on the back and lumbar, and a moderately curved seatpan.